Our local school students (junior & senior) will be asked to produce and submit a painting or drawing of a Dugong, Turtle or Dolphin. From these entries, three artworks will be chosen by our panel, which includes Rosslyn Kennedy owner of the Seaside Artists Gallery and two of the Gallery’s internationally renowned artists, they have generously agreed to be our competition judges. The three winning images will subsequently be digitally ‘reduced’ and transformed as a range of postage stamps by Australia Post… 50c, $1.00, $1.80 value. All proceeds from the sale of these stamps will go toward research into our Moreton Bay wildlife… especially our very rare Humpback Dolphin (only about 100 in the Bay!). Dr Justin Meager of the Environmental Heritage Protection Agency (EHPA) has kindly agreed to help the project. The winning artworks will be offered for ‘auction’, with proceeds going to the artists; however all entries will be acknowledged and reproduced into a ‘booklet’, together with all our Poetry Competition poems, a literary & visual ‘time-capsule’ of our young people’s efforts? 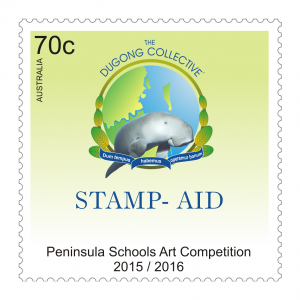 The booklet (and stamps) will be available on-sale through the Seaside Artist’s Gallery and other local outlets… proceeds will also go toward current Moreton Bay Humpback Dolphin & Turtle Research being undertaken by the EHPA. We hope you’ll join us in this Moreton Bay wildlife challenge? !